LXX Scholar Interview: Dr. Jan Joosten | Septuaginta &c.
Today I have the pleasure of presenting another of my LXX Scholar Interviews, this time with Dr. Jan Joosten, who is currently the Regius Professor of Hebrew at the University of Oxford. If you didn’t see the post previously, you can listen to his inaugural lecture here. To repeat some of what I have said before, if you are interested in Old Testament textual studies, you will have almost certainly run into his work. If you are a graduate student interested in Old Testament and/or Septuagint studies, you should strongly consider getting in touch with Jan about supervising. Either way, I am sure that this interview detailing his “academic biography” will prove interesting and shed some light on Jan’s qualifications and activity in the discipline of Septuagint. After a licentiate in Protestant Theology in Brussels (1981) and a one-year degree at Princeton Theological Seminary (ThM 1982), I received a scholarship to study at the Hebrew University in Jerusalem. From 1982 to 1985 I studied textual criticism of the Hebrew Bible, and many other things, with Moshe H. Goshen-Gottstein. Among the other seminars I took was one on the Septuagint with Emanuel Tov. But I really got into Septuagint studies only much later, in 1994, after getting my first teaching job at the Protestant Faculty of the University of Strasbourg. As professor of biblical languages I was expected to teach a research seminar for masters students. I figured the Septuagint would be a fitting subject, since the students were supposed to have had at least one year of Hebrew and Greek. I proposed a seminar on the Septuagint of Deuteronomy 32, which was a success (I had four students). In the following years I continued to teach the course on various biblical chapters. My research on the version developed from the teaching in this seminar (my first article on the LXX: “Elaborate Similes—Hebrew and Greek. A Study in Septuagint Translation Technique” Biblica 77 , 227-236, was spun out from an observation on Deut 32:11). 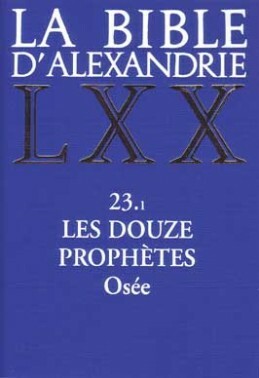 to LXX studies because it embodies the approach of the version as a text in its own right. Among biblical scholars the LXX has often been—and continues to be—studied as an ancillary text: a collection of variant readings in textual criticism of the Hebrew Bible, or a source of religious terms in New Testament exegesis. 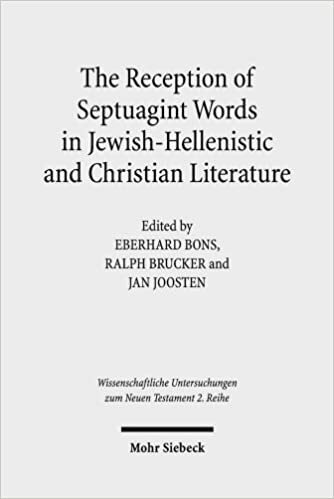 In Antiquity, the Septuagint was read simply as Scripture, among Hellenistic Jews first, and later among Greek-speaking Christians. My personal contribution to the study of the LXX is for the most part tied to linguistic phenomena situated at the interface between the Hebrew source text and the Greek translation. Language is a subtle instrument, expressing not only a propositional meaning, but also, at times, revealing other details: on the culture and background of the translators, on their knowledge of Hebrew, on their approach to the source text, and much else. 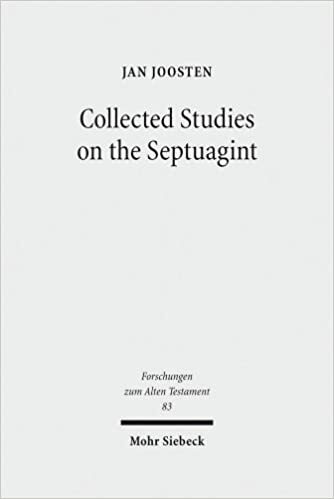 A sample of articles has been published in my book: Collected Studies on the Septuagint. From Language to Interpretation and Beyond (FAT 83; Tübingen: Mohr-Siebeck, 2012). Some of the articles are available on academia.edu. In Strasbourg I taught the seminar on the Septuagint yearly for almost twenty years, sometimes with my colleague Madeline Wieger. In 2014 I was appointed Professor of Hebrew in Oxford. I use the Septuagint in classes on textual criticism, but do not teach it as such. My close colleague, Professor Alison Salvesen does teach Septuagint regularly. At some point, in the early 2000s, I thought Septuagint studies would go mainstream, causing a long overdue upheaval in biblical studies. Now I’m not so sure. The OT – NT divide is as strong as ever, it leaves little space for Septuagint studies (except as an ancillary text, see above, question 2). A lot of work remains to be done on the vocabulary of the Septuagint (see the next question). Also important is research on single translation units of the Septuagint: practically each book comes with its own challenges and opportunities. Although lately a few studies on the style of the Septuagint have appeared, this is also a field that remains largely unexplored. 6) What current projects in Septuagint are you working on? The near future is when all the books of the Septuagint will finally be available in a full-scale critical edition. A more distant, and perhaps utopic, future is one where the Septuagint and the Dead Sea Scrolls will be fully integrated into biblical studies. Thanks to Dr. Joosten for his willingness to do this interview, and, of course, for his prolific and scholarly work in the field. Stay tuned to this series for further interviews with other scholars working in Septuagint. Feel free to comment below with scholars you’d like to hear from, or questions of interest. Thanks for this interview! We are going to have Dr. Joosten down here at Catholic next week for our annual Hyvernaut Lecture. Thanks for this encouraging and inspiriting [sic] interview. Pingback: Visiting Oxford Fellowship in Septuagint Studies (2017-2018) | Septuaginta &c.
Pingback: Supervisors & Programs for Septuagint Studies – Part I | Septuaginta &c.